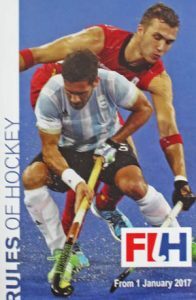 FIH Rules of Hockey (2017). Rob Cann, Charlie Pritchard, David Ackland, Gus McVey, Guy Rudolph, Maggie Heal, Mike Dutton, Ian Davis, Peter Rider. Please contact Mike Dutton – 01392 881950/07488 287257 – if you want to help out with the umpiring. WATCH THIS SPACE LATER IN LATE AUGUST 2019! It is important that you keep entering your umpired games on the DH website, at least until you are officially marked as “active” by DHUA (minimum 3 game for a player-umpire, 5 minimum 5 games for an umpire who is not registered as a player). Note that you do not need to enter DHUA appointed games as those will be added automatically to your match history. Following the DH website upgrade in Oct 2018, the process of adding games to you match history is slightly different. After going into your Personal Area (with email address and password) there should be four main blue bars near the top of the page that you’re presented with; click on “Your Umpiring History” and a few paragraphs of explanatory text appear, the paragraph in bold type telling you whether or not you are marked as “active”. Click on the “View and Update my history” – the new page lists all the games in your history, any appointed games appearing first, followed by non-appointed games (the most recent at the top of the list). To add a game click on the green box “Add a match to my history” and bear in mind that, after selecting the Date and Competition you may well have to select the home and aways teams from drop-down menus to proceed to the final Confirmation page. Next Exeter or Taunton based Umpiring Course. Nothing yet arranged – watch this space. 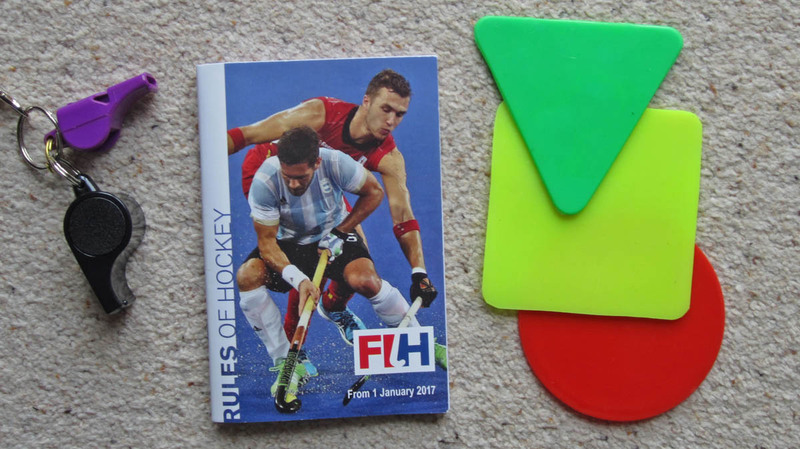 Umpire Training Modules (England Hockey). All umpires are encouraged to follow the link below where you’ll find new online training modules. These intended primarily for new and inexperienced umpires and combine quite a number of video clips with some clear, concise guidance and explanation. Fol-lowing the successful completion of a short test, users can also download a certificate of awareness. Rules education and testing is now available. Please go to England Hockey Online Training Hub. To access this area of Hockey Hub, you need to be registered and log in first. Registration is free and takes only a few minutes. Currently our Umpire Development Officer (UDO) Mike Dutton looks after this aspect. During the main season, he will email all Club umpires each Sunday or Monday referring them to this website page, asking for their availability for the games requiring umpires over the following weekend or two. On the following Thursday a “Confirmed umpires” email will go out, directing umpires, relevant team captains and fixtures secretaries to this website page again; this confirmation notice will always include confirmed DHUA-appointed umpires and may, if necessary, request further volunteers to fill any umpiring slots that are still vacant. If you are approached directly by another club for your umpiring services, could you please refer the request to Mike Dutton; he will then check to see if the Club can spare you (or an alternative ump) for the fixture in question; if so, Mike will (in most cases) ask Graham Woolcock at DHUA to give us a “Club Appointment” to that game, or appoint a named umpire of our choice – this can often be done at short notice. We may, on occasion, be more understanding as far as Honiton Hornets HC is concerned as we have in the past benefitted by using a few of their home fixtures (at Ottery) as development games for the our unassessed umps; this is not possible this season (2017-18) as Hornets are in Petroc 1, a division in which unassessed umps cannot be used. The main change is to bring consistency across the game to the penalties imposed when a Red Card is shown – the changes are already in effect so you will need the new form for any matches that you umpire from now on. Where a player has been shown a Yellow card for a minor offence and then commits the same offence again, a Red Card should be shown – however, this offence will only result in suspension from that match – there is no further ban imposed. NB. the form must still be completed for all Red Cards awarded for whatever reason. 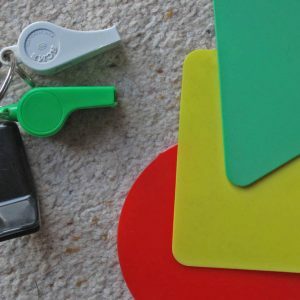 A red card can be awarded to any coach/physio/manager whether there is a team sheet or not – and if such a person is awarded a red card, the team must play with one less player for the remainder of the match. The Red Card does not necessarily have to have been shown for a Red Card offence to have been committed – being asked to leave the arena is the same as being awarded a red card. You cannot rescind a red card after the match (other than in cases of mistaken identity – when the true culprit should be identified and issued with an MMO). An MMO is used for any offence for which a red card would have been awarded that takes place on the day of the match before the whistle to start the match or after the final whistle. Any offence involving violence or the verbal abuse of an official cannot be treated as a minor offence and will result in a 16 day (minimum) ban. We are fortunate to retain a good umpiring base at the Club with 20 qualified umpires (2017-18 Season), 4 of whom have Level 1 un-assessed status. 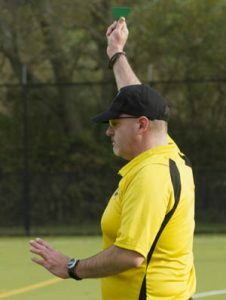 We’re always on the lookout for fresh umpiring talent and anyone interested in becoming an umpire should contact the Club’s Umpire Development Officer (UDO) Mike Dutton. Mike, an accredited EH Umpire Developer, will continue to make it his business to help bring on budding talent (young or not-so-young) and guide him/her through the qualification process, in close association with the DHUA. All our umpires are officially “affiliated” to Sidmouth & Ottery HC, and listed as such on the DHUA website. 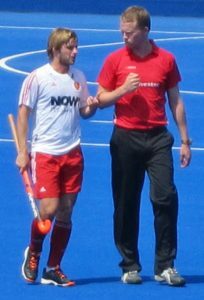 Currently, it is a requirement of the DHUA (and England Hockey) that player-umpires must umpire a minimum of 3 games per year to retain their “active” status; for non-playing umpires the minimum requirement is 5 games per year. Games umpired must be logged on the DHUA website where each umpire has his/her own password-protected “personal area” already set up. Umpires who fall short of the required minimum number of games during any one year up to 30th June may be “de-activated” by DHUA; in that event, he/she will then need to be re-assessed before their status can be re-activated to resume umpiring league games, but they would be able to umpire friendly fixtures. We retain strong links with the DHUA and, for start of the 2018-19 season, we have a B Club Agreement which lays down various benefits for the Club, e.g. prioritised allocation of umpires appointed to our home games, free coaching for umpires, together with the Club’s reciprocal responsibilities such as payment of fees for appointed umpires and making some of of our club umpires available for appointments to neutral games (away from Ottery St Mary and Sidmouth). Note that we pay annual registration fees to DHUA on behalf of our “active” umpires (£15 per umpire aged 21 or over). Note that the cost of the course is currently £50, to be paid online, and you will be required to complete an online Rules test before attending. The Club will refund the course fee when (after completing the course) you’ve umpired a minimum of 5 games for Sidmouth & Ottery. Please first register your interest with Devon Hockey (Devon Hockey will need to have a rough idea of numbers interested before arranging a course in Devon). Umpiring courses around the country. Please the notes carefully and see if there is a suitable course in our area. If so, BOOK ONLINE NOW. To continue, you will need to set up an England Hockey account (with username and password) but don’t let that put you off (you’ll then need to wait for an email back from EH before you can proceed further). The online Rules test is pretty basic – and remember, Mike Dutton can help you along the way after you’ve done the course, with initial mentoring and coaching as necessary before you exercise your option to request (free) coaching through DHUA.